For EMERGENCY SERVICES during tournament play, first responder services will be on-site at the tournament. Clemson University will also have an Athletic Trainer on site at the tournament for dealing with minor athletic issues for both spectators and players. If EMERGENCY SERVICES are required, call 864-869-2106. This number is the Reserve Golf Pro Shop, which will be monitored during the hours of tournament play. Use of this number should be limited to only true emergency needs. As always, the use of the 911 number for an emergency is also appropriate. There may be limited cell phone coverage on the golf course. If necessary, simply moving to a new location should improve cell coverage. Also, if a tournament volunteer is located in the immediate area of the emergency, please alert that volunteer to the emergency and its nature, but do so only after calling the emergency number or 911. Priority for these services will be given to tournament players as needed, but depending upon conditions may be available on a limited basis to spectators. If available, these services will be for minor athletic type injuries and minor issues only. For GENERAL INFORMATION SERVICES Clemson University will maintain a desk on the veranda of the Orchard Clubhouse to assist with both participant and spectator questions upon arrival at the tournament site. In addition, should spectators have on course questions, there will be a help line available at 864-869-2105. This number should NOT be used for emergency services as it may not be continuously monitored. Near real time scoring for the tournament can be obtained through the Golf Stat link on this web site. Also, a spectator summary handout and tee time grouping will be available each day on the Orchard House Veranda and at the Halfway House. 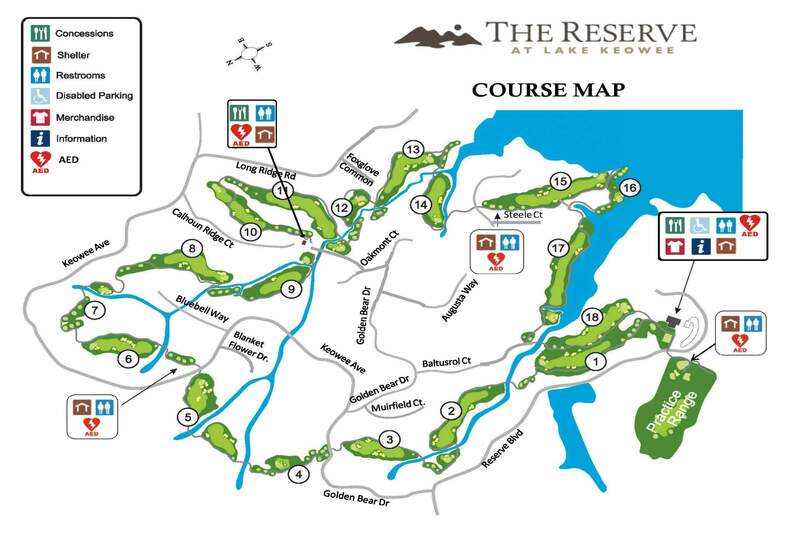 The tournament golf course at the Reserve at Lake Keowee is a continuous loop course in sometimes hilly terrain. After leaving the first tee, spectators will not return to the Orchard Clubhouse until the completion of all 18 holes of play. Walking spectators should consider the course to be a medium exercise experience and should be prepared for a minimum of five hours on the course. Spectators may want to consider renting a golf cart, which can be arranged prior to the tournament through individual team coaches. The procedures for renting golf carts is described in the Golf Cart Rentals link. To assist with the speed of play there will be several locations on the course where competitors will be shuttled from point to point on the golf course using tournament golf carts. These carts will not be available for spectator use as they are dedicated to tournament operations. The map immediately below provides a course map and identifies the locations of restroom facilities and primary shelter locations. AED equipment can be found at the Orchard Clubhouse, the Halfway House at the 10th tee, and restrooms at #6 and #15 tee boxes. Water, restroom facilities, and limited shelter are available at the first, sixth, tenth, and fifteenth holes. All spectators should also be prepared for inclement weather should it occur. Weather forecasts and weather radar maps for the golf course area can be obtained at the following links. A single air-horn blast will be used to inform players and spectators that play has been suspended for weather. Should a weather delay occur, a matrix of sheltering in place locations has been developed and is available for both spectators and participants. Many of these locations are graciously provided by various Reserve at Lake Keowee residents and consist primarily of underdeck weather sheltering. Signage on each hole, located by the cart paths, will identify the weather delay sheltering locations for each hole as shown below. Should it become necessary for safety reasons to evacuate the golf course, evacuation vans will be initially dedicated to evacuating the participants to the Orchard Clubhouse. Accordingly, spectators should use individual resources to return to the Orchard Clubhouse, the Halfway House at the 10th tee, one of the restroom facilities located at holes 6 or 15, or to shelter in place at one of the Weather Delay locations shown. Spectators who have rented golf carts should proceed to return to the Orachard Clubhouse, or to the 10th tee halfway house until conditions improve or play resumes. Spectators who have rented golf carts should proceed to return to the Orchard Clubhouse, or to the 10th tee halfway house until conditions improve or play resumes. When all players have been evacuated, limited van service will be available to assist in evacuating spectators remaining on the course to the Orchard Clubhouse or Halfway House. These vans will make stops at the tees on hole number 4, the Halfway House at number 10 tee, and the restroom facilities at the tees on hole numbers 6 and 15. Spectators wishing to use this service should make their way to these locations for evacuation support. The map above show the locations of the weather delay shelter locations and evacuation van pickup locations for tournament players.